Maintaining correct fertilizer moisture levels has become a critical component during the various stages of fertilizer production. Fertilizer can easily become either too wet or dry wasting manufacturer’s time and money as well as impacting the quality of the end product. With the help of industry partners and 40 years of knowledge and experience, MoistTech has developed the IR-3000 moisture sensor that is ideally suited to measure the moisture levels in fertilizer. MoistTech Corp. is a leading global manufacturer of Moisture Measurement Sensors and equipment, first established in 2003 by Director John Fordham alongside two other fellow engineers. The company have their head office based in Sarasota, FL, which covers North & South America, and other locations across Asia, Africa, the Middle East and Europe. The biggest benefits MoistTech customers realise with its sensors are energy reduction and drying control. Quality and energy savings are a big focus for our customers; the energy savings are significant in the reduction of over-drying. Not only is it about quality, moisture is money and one additional percent of moisture can cost an enormous amount of money in a lot of manufacturing facilities. The IR3000 sensor offers unparalleled performance, with a strong reliable service that delivers stability, maintainability and controllability, producing the perfect solution for moisture maintenance. Its unique features make the IR3000 adaptable to a variety of material variations such as colour, height of material, and size, allowing the sensor to produce accurate readings regardless of material distinctions. Not only that, but it can also be used within the most extreme locations. With an easy application and maintenance free service, the IR3000 delivers reliable assistance for any moisture measurement requirements. Non-Contact measurements are extremely important with fertilizer applications and most other methods are in contact with the product, which causes the sensors to wear out. MoistTech’s technology allows for a non-contact reading, providing instantaneous readings on the manufacturing line. Each sensor is customised to the customer’s precise application prior to being shipped so it’s essentially a plug and go systems when it arrives to the customer. It has the capability to store up to 50 product codes if you are measuring more than one product on the line as well, making its ease of use very convenient. MoistTech’s sensors feature unique technology that are able to calculate measurements through the near-infrared (NIR) region of the electromagnetic spectrum, to accurately measure and control moisture from lab to line. These advanced online sensors create a non-contact application which can process hundreds of measurements per second. These measurements result in thousands of varied applications, with MoistTech’s online sensors’ precision motivated technology offering a no-drift optical design. Their innovative sensors are designed specifically to ensure accuracy and repeatability, and in addition, there is also no need to regulate temperature control, making for even better ease of use. 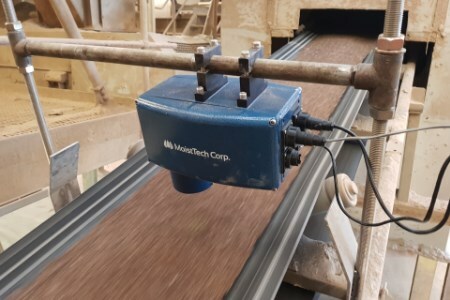 Through their 40 years of expertise, MoistTech is leading the way in moisture measurements, with their sensors adaptable for most any fertilizing application requiring moisture or thickness measurements within their manufacturing process. The company’s expansive growth has led to global recognition, and last year they achieved a winning milestone for the company, having achieved an astonishing 50 000 installations. MoistTech’s incredible success and constant advancements have allowed the company to become one of the world’s leading manufacturers within the industry. With much on the horizon in terms of expansion and future development, MoistTech aims to increase their worldwide presence and consolidate their already established success. Last year, they attended a number of tradeshows across Asia, North America, Europe and South America where they showcased the uses and benefits of their newest Near-Infrared Technology. Author: Sarah Hammond, MoistTech Corp.